There’s lots going on at the railway over the Easter weekend! Between 20th and 22nd April children (ages 2-15) travel free if they bring a decorated egg (and a fare-paying adult!) with them. 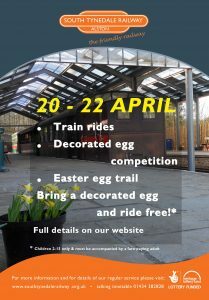 Your decorated egg will be displayed at Alston station and judged at 12:15 for the first train, 14:45 for the second and 16:45 for the third. So if you’re travelling from Slaggyford don’t worry just bring your egg with you, take it to the ticket office and we will include it in the judging! You can collect your egg as soon as judging is finished. Follow the Easter trail around Alston station and if you solve all the clues there’ll be a chocolatey prize for you. The trail is free to enter.